After much prayer and anticipation, we were again able to hold a series of services in South Carolina. While through its history our ministry has been closely connected to churches in this region of the country, it has been awhile since we have had the opportunity to minister there. The recent services in the State reconnected us with our past history in ministry and reinforced our vision for the future. We are thankful for the given opportunity and the multitude of friends we were able to see once again. What an exciting time we had at the Ft. Inn Christian Academy in Greenville, South Carolina. Our visit there was on the spur of the moment upon the invitation of the leadership of the school. Ft. Inn Christian Academy is one of the few Christian schools in the Carolinas associated with the Church of God. It was a thrill to speak with the students who surprised us with their interests in Biblical topics. Usually, when we minister in schools across the country, teenagers would ask about Bulgarian culture, our ministry there and perhaps some curios facts. This was not the case at the Ft. Inn Christian Academy, where the first questions were about the Bible and more specifically the Book of Revelation. We discussed topics of eschatology such as the 70 weeks of Daniel, prophetic signs of the End Times, the spirit of the Antichrist, the mark of the Beast and many others. It is encouraging in this day and time to meet with young people who have such knowledge and interest in the Bible. 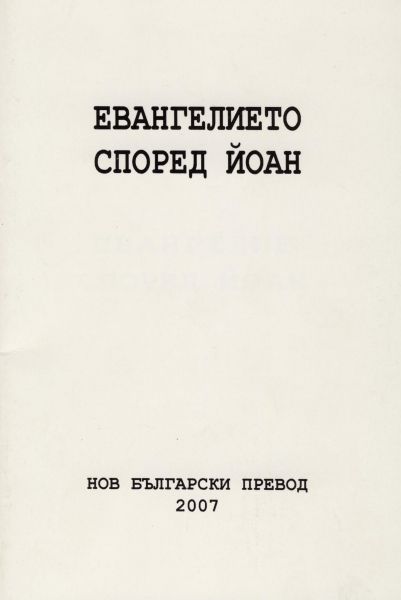 In April of 2007, Cup & Cross Ministries along with our Bulgarian partners released a digitized revision of the first Bible in modern Bulgarian vernacular. The initial translation was first published in Constantinople in 1871 to become the leading text of the Bulgarian Renaissance. Unfortunately, 130 years later certain letters from the alphabet have become distinct and the text is hard to read by the common Bulgarian reader. To provide the text in a readable from, a team of 40 people cooperated in a three–year task which was successfully completed in 2006. The final revision was released by Cup & Cross Ministries in April of 2007 and since then has reached thousands of people. We were successful in signing a contract with the Bible Works software developing team, who will include the digital revised text of the Bulgarian Constantinople Bile in the next edition of the software. It is always a joy to return to Florida and minister at churches who pray for our ministry on a daily basis. We are excited to visit and minister at the Everglades Community Church and the Chokoloskee Church of God and to be reacquainted with people who love us and support us in our ministry efforts. We were glad to deliver an important message on the “Spiritual Authority of Divine Healing,” a theme that the Lord has impressed on us in the past year since the Miracle Healing Revival at High Falls which we held in the winter of 2007. It was a time of homecoming and celebration and we hope to see them soon again with new opportunities to minister. It was a great personal joy and satisfaction to see the results of many years of work come to a reality. On Christmas Day, after a long time of prayer, fasting and translating, we were finally able to release a new Bulgarian translation of the Gospel of John prepared directly and literally from NA 27. It was indeed an indescribable feeling to see the first printed copies being distributed to church bookstores, Bible markets and public libraries as our personal and precious gift for Christmas. Commentators that were able to review the new translation over the holidays are already calling it a “bold step toward the true meaning of the Bible” and “a revolution in Biblical interpretation.” But for us, it is a fulfillment of a long-lasting dream and the fulfillment of a vision which God has put in our hearts many years ago. After over a decade of studies and preparation, the first fruits of this work is finally an undeniable reality – a text of a new translation which can be put in the hands of people hungry for the Word of God. But this is only the first step, only the beginning of something new which God is doing in Bulgaria in 2008. We are approaching 2008 with great anticipation that God is readying us for a new thing, as we are reminded that our spiritual anticipation has been built since 2005 which we called the Year of the Spirit. Then, 2006 followed as Year of Promises and indeed we all saw promises being fulfilled and visions coming to a definite reality. The very beginning of 2007 came as the Year of Breakthrough, and today we can testify of a Divine Breakthrough in both spiritual and material realms. Now, God is preparing us for something new in 2008. We are anticipating developments in every area of life and ministry. We believe it and we proclaim it . 2008: Something new is about to happen.